BA - 400 Core, Slitter, Fracture & Spiker Aerators. Aeration encourages roots to grow deeper by increasing the oxygen supply to the root zone for healthy green grass. - Eliminates surface disturbance and core residue. - Relieft of compaction during the season. - Now available in 3pt hitch. 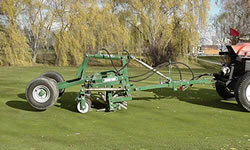 The Bannerman BA-400 Multi-Ject Aerator is 48 inches wide with newly designed tine reel assemblies which allow for smoother operation and more holes per square yard. Also new for 2002, is the Spiker Tine, used for surface aeration. The Multi-Ject can now be fitted with a total of four different types of tines. Available in Tow-Behind with hydraulic wheel lift or three point hitch. Floating roller attachment is also available. The Spiker Tine has a 10-1/2" diameter and is manufactured hardened surgical steel. The BA-400 has a total of 26 tines, each blade with 15 spikes or points, set on 1-5/8" centres, for total spiking width of 38". The tines spin freely on hardened tine shafts.